Sun., Aug. 5, 2018, 5:31 p.m.
WATKINS GLEN, N.Y. – Like father, like son. Mired in a confounding losing streak since the start of his NASCAR Cup career in 2016, Chase Elliott finally broke into the win column Sunday, holding off road course ace Martin Truex Jr. at Watkins Glen. The son of Hall of Famer Bill Elliott, who also won his first Cup race on a road course (Riverside in 1983 in his 124th start), Chase celebrated a triumph he will cherish forever. Out of fuel after the finish, he was pushed to victory lane by the banged-up No. 48 Chevy of seven-time Cup champion Jimmie Johnson, a teammate and one of his staunchest supporters, as his father raced to join the celebration after spotting. Toss in the raucous cheers of the sellout crowd and it doesn’t get much better than that. 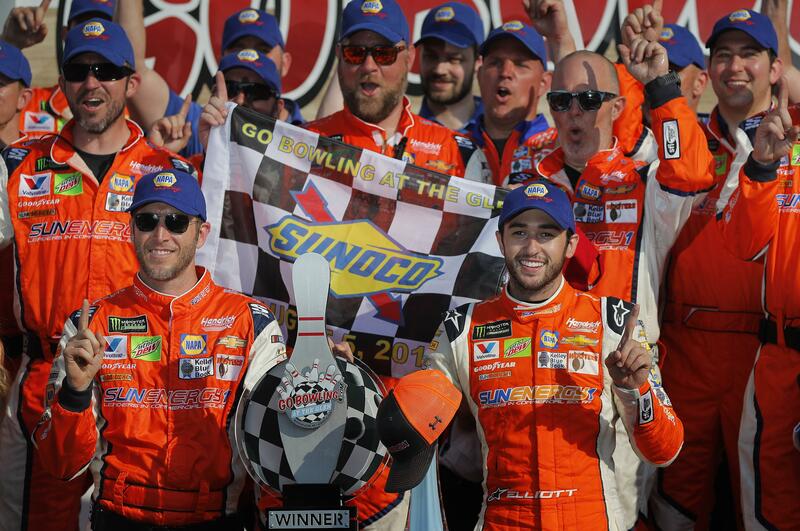 Elliott’s victory came in his 99th Cup start and was the 250th win for Hendrick Motorsports, breaking a 37-race losing streak for one of NASCAR’s signature teams. It also assured Elliott a spot in the playoffs as he became only the fifth driver to win a race other than Kyle Busch, Kevin Harvick and Truex, who have combined to win 16 of 22 races. Truex ran second to Elliott for most of the final stage and began to steadily close as both drivers tried to save enough gas to reach the end of the 90-lap race. It was a two-car breakaway as the rest of the field was more than 11 seconds back. Truex closed to the back bumper of Elliott’s No. 9 Chevy as his car bobbled slightly out of the first turn on the final lap around the 2.45-mile natural terrain layout. But Truex’s No. 78 Toyota skidded, Elliott regrouped and pulled away and Truex sputtered home, out of fuel. Truex was bidding to become the first Cup driver to win three straight road races since Tony Stewart accomplished the feat just over a decade ago (2004-05). Kyle Busch finished third, 20 seconds behind, followed by Daniel Suarez and Erik Jones, a triumvirate of Joe Gibbs Racing Toyotas. Pole-sitter Denny Hamlin finished 13th. Published: Aug. 5, 2018, 5:31 p.m.